Changes proposed in a lawsuit to the water intake system at the nuclear power plant near Richland could cost ratepayers more than $20 million, according to Energy Northwest. It has asked Thurston County Superior Court to give the agency legal standing in the lawsuit filed by conservation groups against the state's Energy Facility Site Evaluation Council because of the potential cost to electricity customers. Three conservation groups have challenged the nuclear plant's permit issued by the state council that allows Energy Northwest to operate a cooling water intake system. The Northwest Environmental Defense Center, Northwest Environmental Advocates and Columbia Riverkeeper filed the lawsuit Oct. 29. The lawsuit maintains that intake screens for the Columbia River water used for cooling at the plant pose an unacceptable risk to juvenile salmon and steelhead based on information from the National Marine Fisheries Service. The Environmental Protection Agency also has been concerned about the screens, proposing that Energy Northwest undertake studies to determine the best technology available or modify the intake screens, according to the lawsuit. Fish get stuck on the screens and are sometimes even sucked through the larger holes, according to Marla Nelson, a staff attorney with the Northwest Environmental Defense Center. The cost of a new intake structure and screen would be $1.74 million, Energy Northwest said in its request to the court asking to be allowed to intervene in the lawsuit. The nuclear plant also would have to be shut down for installation of the proposed system, costing $19 million to $24 million in lost power sales. The installation of a new screen can only be done when water is low in August and September, a time that the plant generates about $1.2 million worth of power a day, the lawsuit said. "The electric ratepayers of the Northwest have a vital economic and electric-energy interest in the outcome of this action," the document said. The Columbia Generating Station produces 4 percent of the electric power used in the Pacific Northwest and all of its costs are paid by public power customers through their electric rates. The five-year permit that took effect in November has increased requirements for the nuclear plant, said Energy Northwest spokesman John Dobken. They include some studies related to the water intake system. A 1985 study, which was done under a plan approved by the National Marine Fisheries Service, found no harm to juvenile salmonids, according to Energy Northwest. 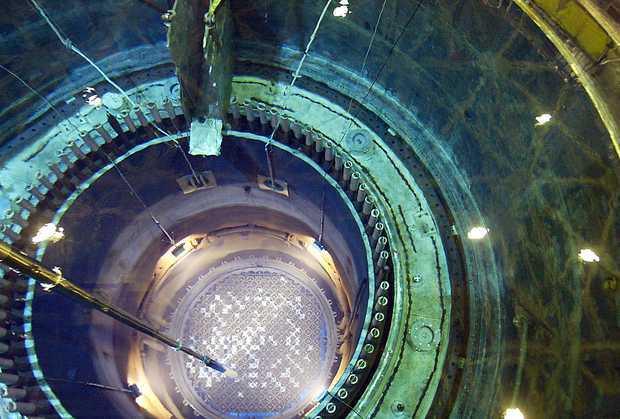 The National Marine Fisheries Service does not have regulations that cover the type of intake structures used at Columbia Generating Station for 30 years, which the state agency took into account when it asked for the new studies, Dobken said. The fact sheet issued by the Energy Facility Site Evaluation Council said that the intake structures were designed to minimize impacts on fish, including locating them well offshore where the number of downstream salmonid fry is expected to be relatively small. The lawsuit also alleges that the permit allows the nuclear power plant to discharge water pollution at levels that violate state standards set to protect fish and public heath. Under the new permit, Energy Northwest will conduct more frequent testing of the effluent released and will have new discharge limits for certain chemicals, which it already meets, Dobken said. The nuclear power plant is well within permitted levels for all categories for water returned to the Columbia River, according to Energy Northwest. The state agency permitting process was thorough and allowed for comments from anti-nuclear groups, federal regulators, Energy Northwest and the public, said Brent Ridge, Energy Northwest chief financial and risk officer. The permit that resulted increased the monitoring, testing and reporting requirements for Energy Northwest, which indicates the state agency listened to comments it received before issuing the permit, according to Energy Northwest. "In 30 years of operation there has never been a question that Energy Northwest is a good steward of the Columbia River ecology and environment," Ridge said. The nuclear plant relies on a closed-loop cooling system in which cold water is cycled multiple times before being discharged. The plant uses about 24 million gallons of water from the Columbia River each day, which is about the amount of water that passes by the intake system every 30 seconds.